​When we first saw the Arozzi gaming chair, it was very obvious that the design and overall look of the chair were heavily influenced by thick leather. We like leather style gaming chairs - the Aarozzi gaming chair as a whole because they’re far easier to clean and they stand out more. The Enzo Arozzi gaming chair is a little unconventional in its visual design as compared to other popular gaming chairs. While the unique design is can be appreciated by many gamers who are looking for something unlike most gaming chairs, the Enzo’s design does seem like it would turn away many gamers who prefer a little more “gaming” chic to the gaming chairs. 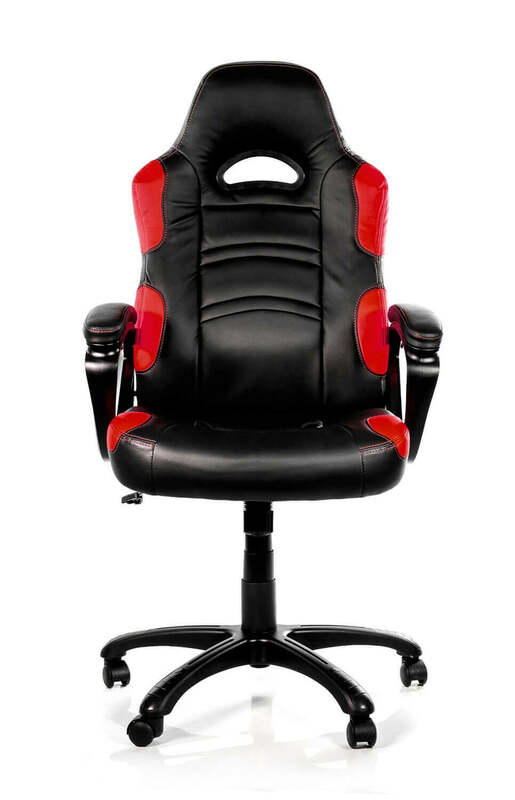 The Arozzi gaming chair seems like an office chair that was given a racing chair makeover. To negate the budget office chair look, the company has decked the Enzo out with high-grade PU leather for its upholstery. The Arozzi design overall wasn’t exactly impressive but the price tag was affordable and we love swiveling gaming chairs. This is a very lightweight chair and while the manufacturer doesn’t provide a lot of details on the chair, it’s a very versatile chair. The frame of this chair is relatively strong and you won’t have to worry about scuff marks on the floor from low-quality wheels which is always a huge plus. The casters are designed to be used on hard floors, but they’re easily swappable and follow the industry standard. Finding replacements for accessories like casters and levels are relatively easy. One large drawback to the Enzo chair is that the fixed loop armrests aren’t adjustable and that the padded sections can’t be replaced for something with more usable surface area. The Arozzi gaming chair also includes a pleasant surprise by possessing a grade-3 gas piston that makes the chair feel a bit safer. Oddly enough the rest of the base doesn’t really instill much confidence in the peculiar way it flexes. The overall comfort of this Arozzi product is dictated by the padded thick leather. We were quite pleased when we sat down into the chair for the first time and it felt like we were sinking into the chair. It was actually a bit difficult to get up from the chair after a little while of use because of how comfortable it was. The base of the chair is also a bit wide which is nice for a little wiggle room. One thing we liked is the spring operated base which allows us to adjust the seat to go higher or lower, depending on our specific specifications. The chair is also very lightweight, so moving it from room to room and putting it together was an absolute breeze. This Arozzi's product design is very simple in nature. It comes in a slick black and green design. The entirety of the chair is black but it has these small patches of green around the outer edges of the chair which start at the very base and runs up to the seating of the chair. There’s a small opening at the very top edge of this gaming chair as well for breathing room. The PU leather used on the Enzo chair is very acceptable in quality, but the quality of the methods used to attach it to the chair makes the chair feel very conflicting when it comes to the upholstery. On one hand, the seat feels premium and is comfortable. On the other hand, if you tend to move around in your seat, you’ll begin to feel the slack in the upholstery. This makes the PU leather on the chair feel rather loose and badly fitted. This would be expected of a much cheaper chair, and while the Enzo is a budget gaming chair, this hardly justifies such a poor level of quality from its producer. The base is very shiny and isn’t as dull as it might appear on other types of chairs. We were a bit surprised with how much the base stood out on the chair when it first arrived because most stands and bases on these gaming chairs usually are a dull version of black and not noticeable. From the height gas spring to the strong base, this was an Arozzi masterpiece that was made to last and isn’t going to bust on you anytime soon. This chair was built with incredibly thick padded leather for a reason and it was meant to support people of all different weight sizes. No matter how tall you are or how large you are under certain limits, it fits comfortably. The materials were made solid and this is something that the Arozzi Company does excel in. They don’t cheap out on the products used to make their gaming chairs and we took a lot of appreciation for that. The wheels were made with nylon casters so you won’t have to worry about damaging the floor or sinking into carpet too much with the prolonged use of the chair. Adding to the durability of the Arozzi chair is the Class 4 gas cylinder hydraulic system. This is much better than other compressed air systems as it lasts much longer. If you have ever used a chair that eventually starts slowly sinking over time, then you understand how important this feature of the Arozzi chair is. ​Swivel – This Arozzi product comes equipped to swivel around at 360 degrees with no limitations. Being able to rotate around is great for people in an office and even in a gaming environment such as a computer desk. Tilting Seat – Being able to tilt the seat back is great for some people because everyone has a different preference. We prefer to the tilt the seat back a little but the problem with most chairs is that it won’t allow you to stay in that position without using your feet on the ground. This chair has a locking mechanism for when you find that perfect tilt position. Nylon Wheels – The Arozzi chair wheels were made with nylon casters and high durability. One of the major complaints of gaming chair wheels is that they scratch the floor or make an awful noise as they’re gliding across the floor but this Arozzi masterpiece is relatively silent. Lightweight – The construction of the materials, while they are very steady, are very lightweight. You can easily roll this Arozzi item around, carry it or disassemble for a trip easily because of how light the back, the base and the wheels of the chair are. Ergonomic - Whether you have a bad back that needs support or your back is in good shape and you aim to keep it that way, the Arozzi gaming chair ergonomic design will keep your posture in the ideal position for good back health. With the right padding at the base of the seat, the lower back is kept aligned offering a comfortable position that supports your entire back. Assembly - Putting this Arozzi product together is somewhat intuitive, though you may need to reread a line or two to make sure you understand clearly what it means. That said, it is fairly easy and since the Arozzi chair uses lightweight materials, it is not awkward at all to fit the pieces together. Be aware that there is a red cap on the underside that needs to be removed before assembly is complete. Extra Padding - The armrest and the seat feature thick padding for extra support and comfort. Having some padding on the armrests is very welcome as it adds so much more comfortable if you end up with your elbows on them for any length of time. The seat cushion is nicely padded and keeps its shape for a long time. As long as the weight limit of 270 pounds is respected, the cushion should not get compressed. This may seem like it is just for comfort, but it also prevents body fatigue which can set in after a long gaming session. Stability - The wide base is ideal at keeping you in your seat without tipping over. The Arozzi chair as a whole is very stable in general, so if you are leaning over to grab something, you won’t end up falling off the chair.One thing to keep in mind is that the armrests also serve as support, so if they are removed, the stability of the chair will be compromised.Stability - The wide base is ideal at keeping you in your seat without tipping over. The Arozzi gaming chair as a whole is very stable in general, so if you are leaning over to grab something, you won’t end up falling off the chair. One thing to keep in mind is that the armrests also serve as support, so if they are removed, the stability of the Arozzi chair will be compromised.Stability - The wide base is ideal at keeping you in your seat without tipping over. The Arozzi chair as a whole is very stable in general, so if you are leaning over to grab something, you won’t end up falling off the chair. One thing to keep in mind is that the armrests also serve as support, so if they are removed, the stability of the chair will be compromised. Q: For people who are over 6’ tall or a little overweight, will they enjoy this chair? A: People have reported that they’ve bought these chairs for heavier people and people who are over 6’ and have found comfort with the chair. It’s also been reported that people up to 300 pounds have used this Arozzi creation with no problem at all. Q: How does the chair lean back? A: The back isn’t a separate entity from the chair, so if you lean back, the base of the chair is going to lean back as well. Once you find a comfortable position, you can lock the Arozzi gaming chair into place so it can’t lean back or spring forward until you unlock it. 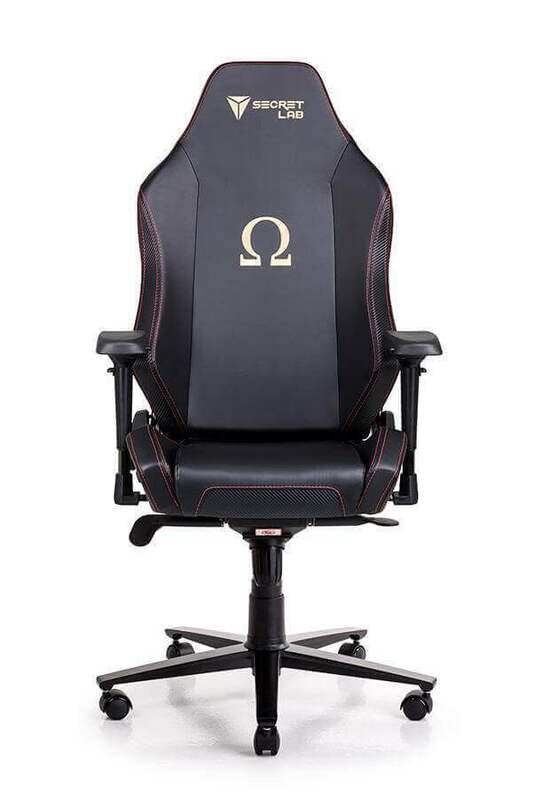 This is a reasonably priced gaming chair that we enjoyed thoroughly but each person will have differing opinions on the overall design of the chair. Some people don’t like the fact that there’s a metal ring covered opening near the headrest of the chair and it’s something you’ll have to get used to. That isn’t the only thing you’d need to get used to, unfortunately. The chair does get a little uncomfortable after long periods of time, especially if you tend to get sweaty. Any sort of moisture causes the leather on the chair to stick to your back and the badly fitted wrap doesn’t help as it likes to slide around after only moderate use. While this is easy to ignore and isn’t that large a problem, it does leave me somewhat disappointed with the manufacturer's quality control. The swiveling of this Arozzi product is smooth and doesn’t make a lot of noise, which was a huge plus as well. This is a great bonus because a lot of gaming chairs out there are noisy. The locking function of the tilt back function is what sold us. This is a great Arozzi creation and recommended for any office or gaming environment.